While technology seems to be getting smaller, people’s expectations for what technology can deliver seem to be getting bigger. People generally want their technology to work lightning fast. A team at Cornell University decided to bring the two trends together by using nanoscale technology to create a battery that charges in seconds. Led by Ulrich Wiesner, professor of engineering, the team decided to rethink the concept of the battery and instead focus on energy storage. Typically, a battery is layered with an anode, a nonconducting separator and a cathode. Electrons build up on the anode due to chemical reactions and attempt to get to the opposite charge, the cathode. The middle blocks the charge, so the electrons instead move along a circuit and power devices as they travel. The Cornell team’s concept intertwines the components in a self-assembling, 3D gyroidal structure by using thousands of nanoscale pores filled with the components necessary for energy storage and delivery. The complex gyroid architecture would allow for maximizing space within a battery—providing more storage for a quick charge. The researchers based the architecture on the idea of block copolymer self-assembly—something they had used for years in other devices. This led them to believe that this concept could possibly be used on carbon materials. 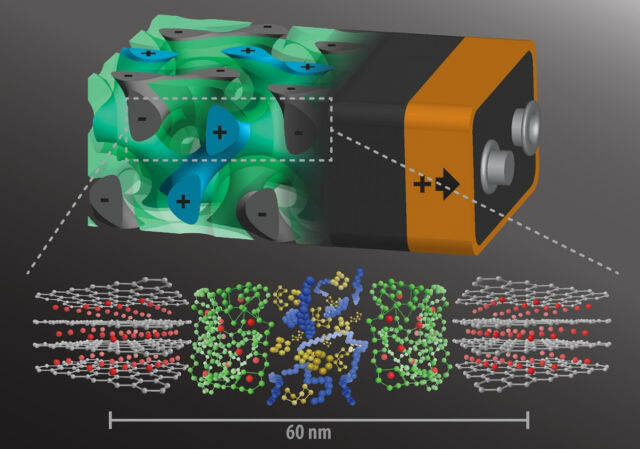 The battery’s anode, which is generated by block copolymer self-assembly, is gyroidal thin films of carbon with pores that are 40 nanometers wide. The researchers coated these with a 10 nm-thick electronically insulating but ion-conducting separator through electropolymerization. This process creates a separation layer that is free from pinholes, which are the culprits that can cause fires in mobile devices. Next, they added the cathode material, sulfur—which accepts electrons but is electrically nonconductive—but didn’t overfill any remaining holes. The final step was backfilling the holes with an electronically conducting polymer, PEDOT (poly[3,4-ethylenedioxythiophene]). Although the concept seems viable, the team still has some challenges to address. While the team is working toward obtaining patents, the concept hasn’t achieved perfection just yet. In the meantime, everyone will just have to wait patiently for their batteries to charge.